"Hi Jit, please see attached picture of an elderly couple. It’s the old man’s birthday this Sunday, he will be 76 years old. 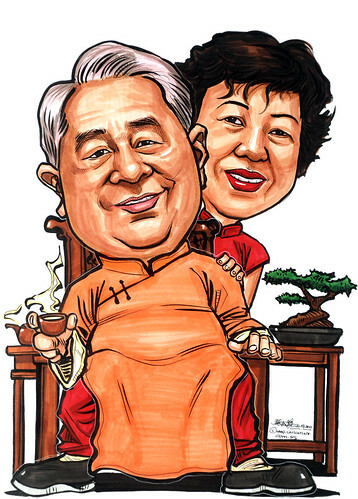 I was thinking of Chinese respectable couple kind of caricature. She can be painted to look like one of those China calendar girls from the 50s and he can be the rich Chinese towkay look in old Shanghainese wear. Colour markers would be fine. We can collect this on Saturday evening or Sunday noon time."